EFF is a mod that extends the follower system to allow for flexibility and functionality by adding many new features to followers and allowing user made plugins to be extended. You may only use my scripts to create framework plugins, you may not use them in your own project. There have been so many changes I've forgotten most of them. Removed source files from BSA, not really necessary, download loose files if you wish to mod. Corrected Quest priority issues causing some actions to take priority over following. Followers are now neither Protected nor Essential, and can now be assigned to be so via "Importance" plugin. Followers residence can now be assigned to where they are currently standing. Fixed Alias script, followers will now "die" properly (Be removed from the system) as well as display the message. Added a font fail-safe to fallback to a generic system font if for some reason there was a problem. All menu functionality is available through dialogue when the menu is disabled. Some renaming of plugin script functions to be more appropriate. Menu configuration "setstage FollowerMenu 0"
Follower commands now accessible through a menu when speaking to a follower. Corrected wedding glitch when it dismisses your spouse during your wedding. Added CLEAR ALL capability "setstage DialogueFollowerExtended 0"
Provided a fix for hireling compatibility on existing save games. Added fail-safe for scripts when the plugin is not loaded. This mod contains three plugins, one of which is optional. Please read the update description regarding the version you are updating to before updating. If this is your first time installing it is recommended you dismiss any followers you may have before doing so. -Followers combat style can be changed to "Default", "Archer", "Berserker", "Mage", "Thief", or "Warrior"
-Followers can be assigned to be "Default", "Protected", or "Essential"
Note: As of 3.5.5 Game Setting tweaks are non optional and require SKSE 1.5.11 or higher they will become configurable in the future when the new SkyUI is ready. Instead of speaking to your followers through dialogue, a menu will popup with a number of available features, this menu can be turned off and you can still access the same functions through the dialogue. -See 3.5.6 changelog, click the blue version text on this mod. Installation should be fairly straightforward if you have a mod manager, download and install. If you do not use a mod manager the Non-loose-files version is recommended, place the two ESP'S, BSA, and ESM in your Data directory. XFLPlugins.esp is an optional plugin that allows for your followers outfit to be changed, this plugin will be updated with more features made by me. Modifies the Vanilla companion system to allow up to one hundred followers as opposed to the original one follower. Also removes those nasty follower bow and arrows. What will it conflict with? Pretty much any other companion limit modification script. It will conflict with the follower tweak that makes 10 followers possible that is floating around, it does a similar thing but I wrote my own methods that can scale by an array so making 100 possible wasn't far off. Dismiss any companion you may have before or after installing this mod to ensure they get out of the old follower alias and into the new. 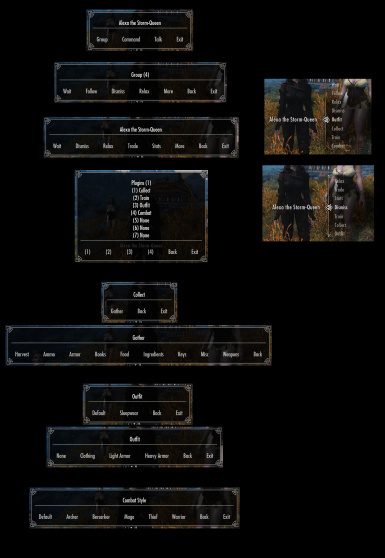 Should be compatible with horse follower mods and Better Followers as well assuming XFLDialogue and XFLPlugin are loaded after said mod. This will clear the entire system, dismissing all followers and should be ready for use. Straight update should be acceptable, you may need to download the horse optional plugin if you used it previously, dismiss all followers and clean save is recommended but not required. "setstage FollowerExtension 500" this will forcefully clear all followers from the system. Dismiss all of your followers before uninstalling/updating, if you do not do this you will never be able to talk to the follower again. This should be pretty straight forward, just dismiss all of your followers and update. Straight updating shouldn't cause any huge problems, just the menu will double up with speech until you dismiss your followers. DO NOT UNINSTALL WITHOUT DISMISSING FOLLOWERS YOU WILL NOT BE ABLE TO TALK TO THEM AGAIN. None, you should be able to just straight uninstall and install with the new version, although it is still recommended you dismiss your companions before doing so. If you are experiencing glitched companions who immediately leave when you request they follow you, use "setstage DialogueFollowerExtended 0" this will force ALL aliases to be cleared, essentially clearing all followers, it is recommended you do this instead of manually dismissing them as this will be faster and ensure the system is cleared out. DO NOT USE THE OLD "setstage DialogueFollower 400"
Before removing this mod make sure you dismiss all of your companions through this system. After dismissing all of your companions you need to make sure none of this mods scripts are still running, to do that you have to stop the quests controlling the scripts. You still create your custom companions in the same manner, add them to the PotentialFollower faction or PotentialHireling faction and increase your relationship rank. Followers tie in with favor, and favor is actually your relationship rank. If your companion uses a custom recruit or dismiss dialogue that means you have to edit the dialogue script, and your companion will not work with this mod because the vanilla functions to recruit are no longer used, I may in the future move the quest portion of this mod to an ESM so users can link to those functions instead. Not sure why you would want to reduce the limit, maybe to put a restraint on yourself I guess. The limit is controlled by a global variable now rather than a static one or zero. (1) If you are having an issue where you tell another follower to follow you but they just stand there and do nothing. CHECK YOUR GAME VERSION, IT MUST BE 1.3 OR HIGHER. Or check to make sure you do not have another conflicting mod that edits the follower system. You have all the dialogue options as if they are following you, but aren't really following you, things like "Wait Here, Follow Me, It's time for us to part ways" this means that they are stuck in the follower system. (3) Why does Cicero or the DBInitiates not work right? Cicero goes into the vanilla system because I wanted to avoid editing the particular quests that deal with it, it ties in with the main companions script and some other critical scripts. It's safer to just leave a few followers in the vanilla system then to edit those scripts and risk breaking compatibility with other mods. Cicero and the Initiates don't technically use the vanilla system at all, they have their own method of "Follow" "Wait" and "Dismiss" they only set or unset the vanilla variable to determine if you already have a follower. Also meaning they won't respond to those corresponding menu commands. Cicero uses an alias to acquire his follower-like packages, the initiates actually have their packages directly on the NPC. What I could do is re-route their commands to my system, but I would have to significantly raise the quest priority of FollowerExtension so that my packages will override his. The only way to completely rid them of their bad system would be to "duplicate" the effects of my system on their aliases, or completely rid them of their system and just plain add them to mine, which would mean editing the actual DBInitiate NPC. I would basically have to do everything twice, once for my system, and once for the DB followers as they would use different aliases.